GUWAHATI: A revolution of a different kind has turned the killing fields of militant landscapes into fruitful ventures. The wonder fruit papaya is at the centre of an agrarian revolution that has helped former Ulfa rebels drop their guns and take up cultivation in Goalpara district. The lifestyle change has made them self sufficient and given them the confidence to export the vitamin-rich fruit to other shores. Leading the tribe of ‘farmers’ is th young rebel Karna Roy with two of hisfellow comrades — Pramathesh Roy and Basudev Basumat. Dudhnoi, about 115 km west of Guwahati, is the scene of the revolution which has yielded phenomenal results in organic papaya cultivation in the past one year since the 29-year-old launched the mission on a 15-bigha plot of land. The joint venture, Panchajyoti Krishak Goat, is attracting hordes of purchasers and about 15 quintal of organic produce has already been exported to Dubai with the help of the recently introduced air cargo facility at the Guwahati airport. “The purpose of our endeavour is not just to earn a livelihood but also to aim for self-sufficiency. This revolution is for attaining self-reliance and to become independent by marching ahead with the masses,” said Karna. Pro-talk Ulfa general secretary Anup Chetia is highly hopeful of his comrades doing even better in the future. Chetia visited the farm at Dudhnoi and showered praise on his boys for mainstreaming their idea. “They had no funds to start the project. But with sheer will-power they toiled hard to achieve this path-breaking success. It’s remarkable,” said Chetia. 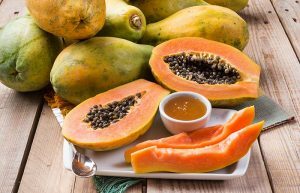 cultivating a few other leafy vegetables, organic papayas have been the best-sellers. We do not use any fertilizers,” said Karna.